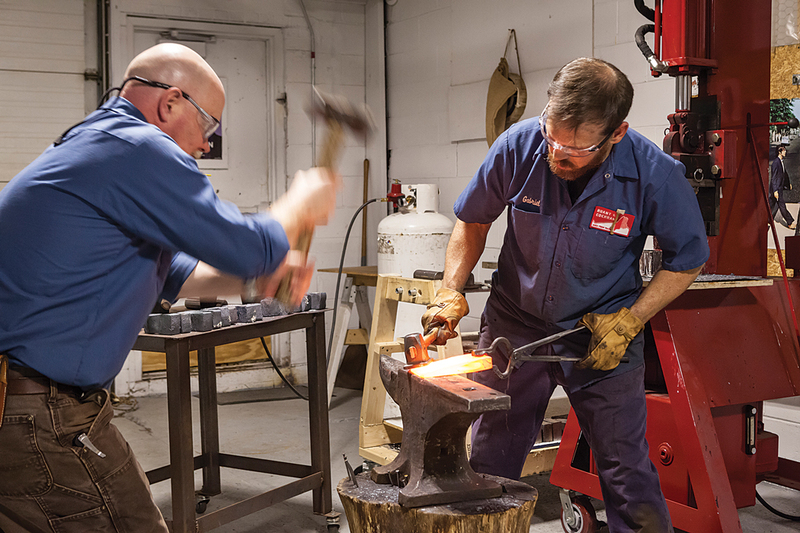 Brant & Cochran metalsmith Gabriel McNeill shapes an ax head for the company’s new line. In November of 2016, brothers Mark and Steve Ferguson were on their way to a craft fair in Oakland to sell restored vintage axes. 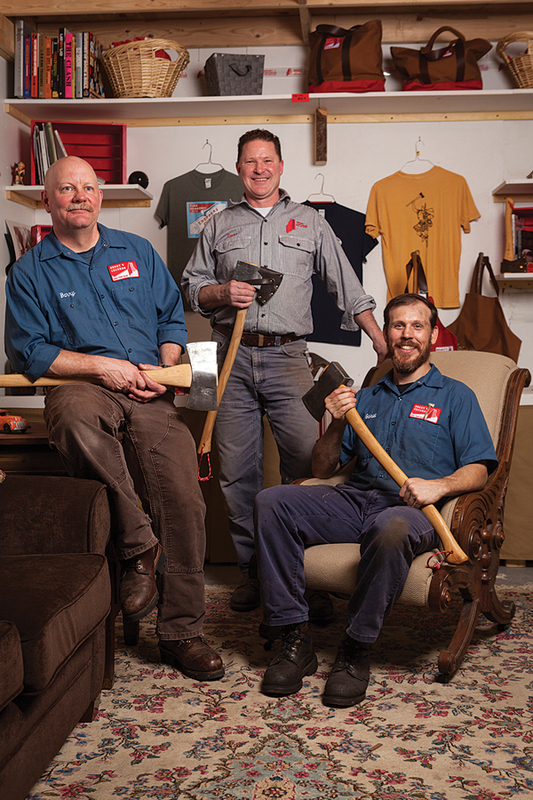 At the time, Mark and Steve, together with their longtime friend Barry Worthing, were scavenging axes from estate sales and old barns and running their refurbishing concern out of a rented, 8-by-8–foot room at Portland’s Open Bench Project cooperative. It was only a side hustle — Mark, a lawyer by training, owned a software company; Steve and Barry were (and still are) a high-school psychologist and an ER nurse, respectively. But whenever they presented their work at craft shows like Oakland’s, the men were struck by the way potential customers lit up when they saw an old ax that spoke to them. The connection seemed almost magical. And yet, as of 2016, Maine couldn’t claim a single company forging and assembling axes here. Until the late 1960s, when the industry fizzled, Oakland was home to up to a dozen ax manufacturers, including the iconic Spiller Axe & Tool Company and Emerson & Stevens Manufacturing Company. “We went up there thinking we were going to sell a ton,” Mark recalled. “But a lot of the young people I talked to, they were unaware that this town had once been the epicenter of the industry.” Mark lamented that loss of historcal memory. The Brant & Cochran forge isn’t so different from what Maine ax makers would have used a century ago, but it burns propane rather than coal. 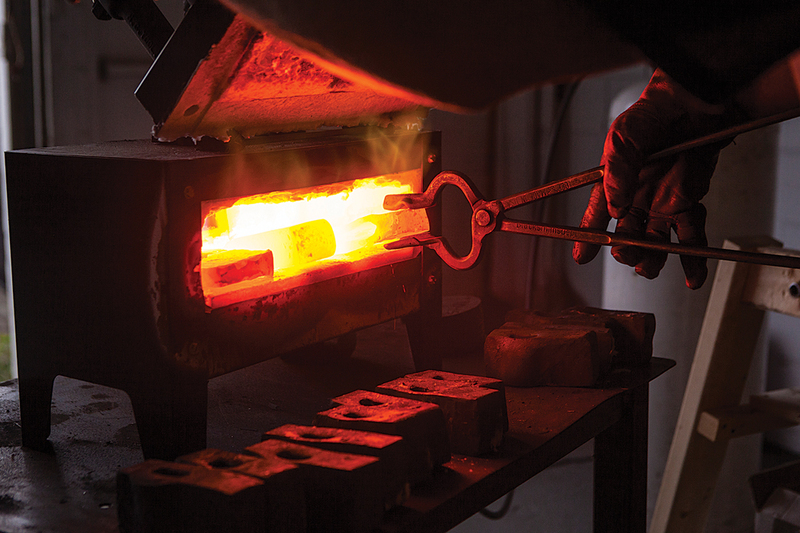 A hydraulic press and die put a hole in a superheated block; it’s then shaped into an eye to accommodate the handle. Last year — following many late-night, Scotch-infused discussions and an ambitious crowdfunding campaign — the trio relocated Brant & Cochran (named for an automotive tool company the Fergusons’ granddad once owned) to an 1,800-square-foot workshop in South Portland’s Breakwater Annex. Today, half of the shop is devoted to restoration, with the Ferguson brothers and Worthing rehabbing axes for clients from as far away as the West Coast. 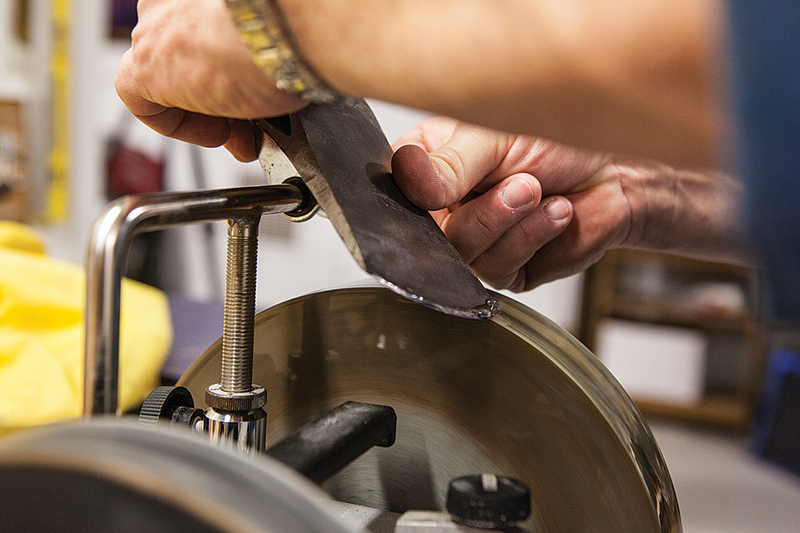 They sandblast the steel down to a shiny patina, use a belt sander with a 2-by-72–inch band to refine the blade, then replace the old handle with a new one made from Bryant Pond ash. 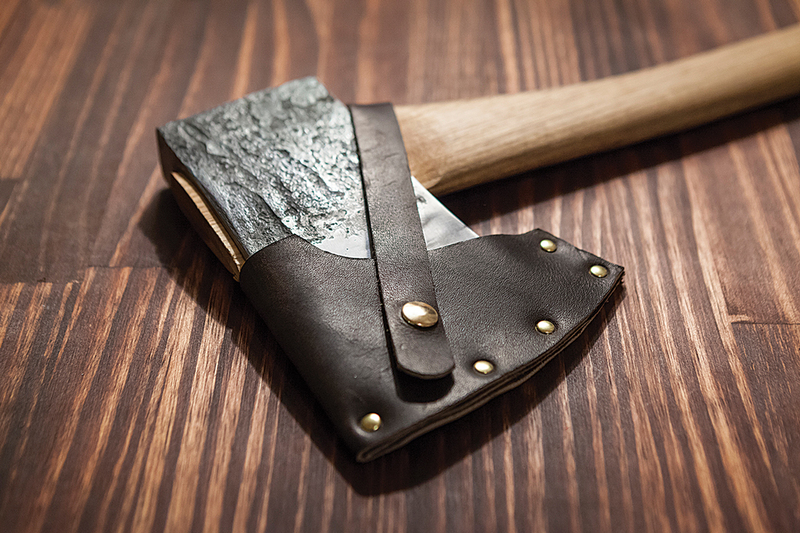 The origin of most any ax can be traced via some marking or insignia or by the profile of its head. Each ax seems to tell a story: one customer found his inside the wall of a house he was restoring; another snuck a pair of axes out of his father’s house on a mission to return them, renewed, as a Christmas present. A typical restoration runs $75 to $100; currently, Brant & Cochran can turn an ax around in about two weeks. 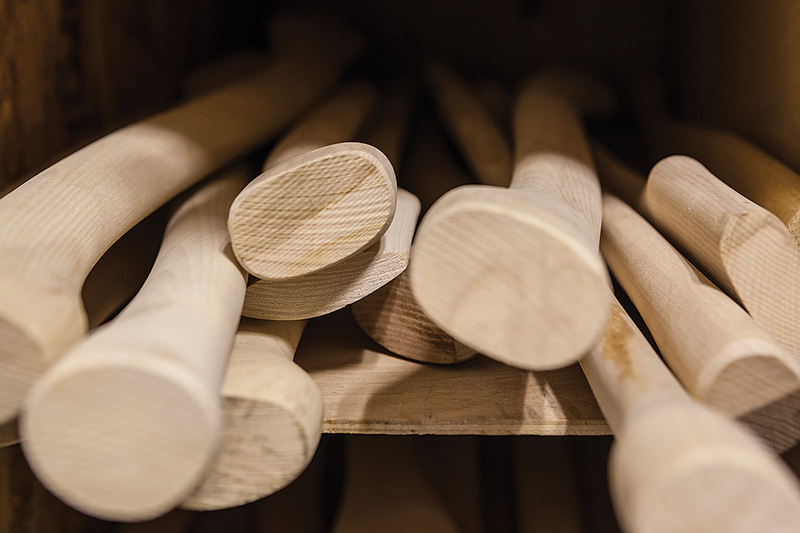 The “anatomy” of a traditional Maine ax is simple, unadorned, even primitive looking compared to the more sweeping, elegant lines of its Jersey and Kentucky cousins. The other half of the shop is devoted to forging what the team calls the Allagash Cruiser, a 2-pound signature ax planned for a spring release. The Cruiser’s head is made from a blank of Ohio steel not much bigger than a bar of soap, made pliable in a 2,200-degree Fahrenheit forge. 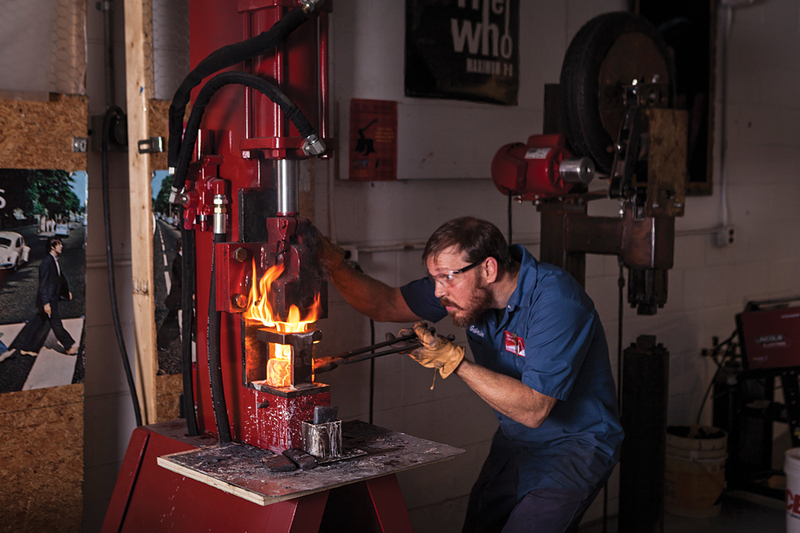 Shaping is done with a 25-ton hydraulic press and a power hammer. 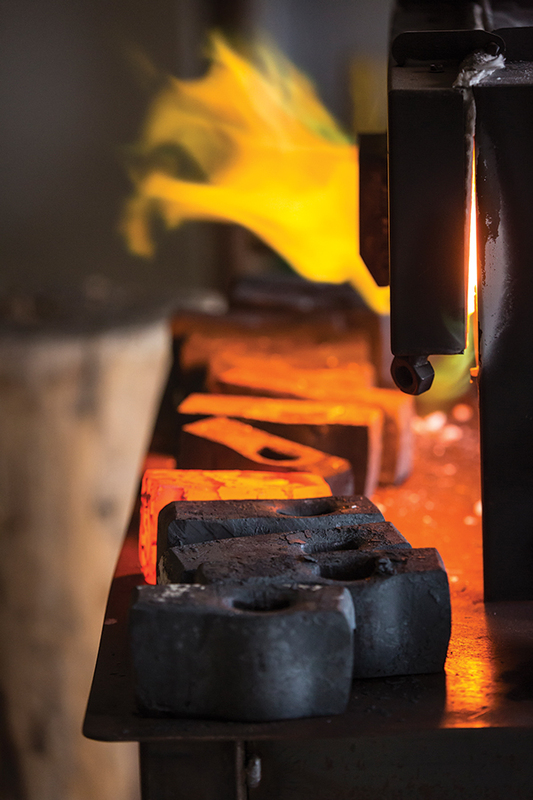 Forging an ax head, the Brant & Cochran founders acknowledge, “is not something you can learn on YouTube.” To run the show, they hired metalsmith and machinist Gabriel McNeill, and together, they plan to create 100 or so axes in their first run, streamlining production as they go. To design the Allagash Cruiser, the Brant & Cochran crew spent the last few years consulting with Rhonda Brophy, director of the Lumbermen’s Museum in Patten, studying the profiles of historical Maine axes in search of inspiration for their prototype. The “anatomy” of a traditional Maine ax is simple, unadorned, even primitive looking compared to the more sweeping, elegant lines of its Jersey and Kentucky cousins. 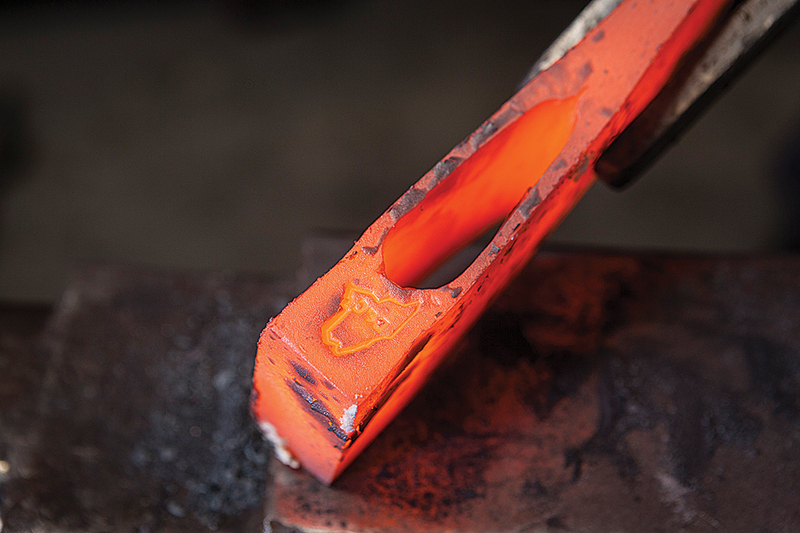 Worthing calls the Maine shape “practical” and “right to the point.” All Brant & Cochran axes will carry the rough forging marks left on the blade as a kind of industrial fingerprint — depending on how you look at it, the marks resemble a Rorschach blot or maybe the Maine coast. left to right: Steve Ferguson, Barry Worthing, and Gabriel McNeill. At the back of the workshop, in a small business office, several T-shirts hang on the wall, depicting artfully drawn labels from Maine’s storied, now defunct ax companies. Brant & Cochran also sells locally sewn log carriers, sheaths, and tool bags. The paper label for the Allagash Cruiser reads: “Wicked sharp. Not kidding.” The ax will cost $200 — maybe five times what you’d pay for a hickory-handled model at Home Depot (made from wood and metal sourced who knows where). But neither is Brant & Cochran out to be some homespun anachronism. The men actively maintain a Facebook page, complete with videos in which they hurl axes into logs, crack beers with forged and branded openers, and reenact lines from the classic bro-down hockey flick Slap Shot. At conventions, they tend to wear matching navy-blue work shirts with embroidered nametags, and their marketing materials employ the maker-curator lexicon of millennial innovation. 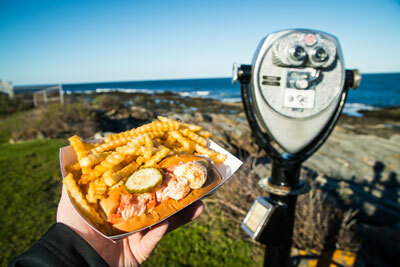 More Making It In Maine. No mention of Snow & Nealley in this article? They’re back to making axes in Maine again. 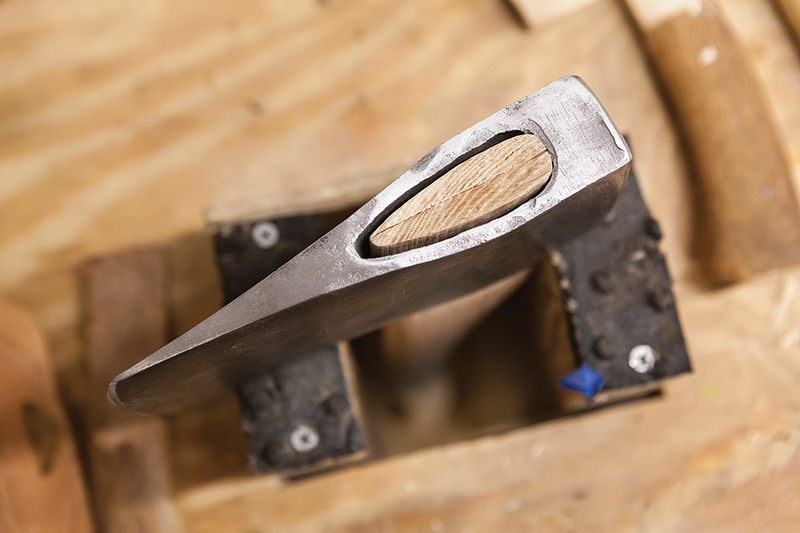 Council Tool down in N.C. is also making axes here.